This is one of the most famous Shiva Temples in India. It is situated on a hill near the village Mapgaon. The architecture is of Hoysala style. The temple was built a long time back in 1764. But its majesty is still intact because of the way it has been preserved. The climate on the hill is cool and the surroundings are scenic. Also, the hill is surrounded by a dense jungle. This provides tourists with both- a good view and tranquillity. Legend has it that Lord Shiva himself stepped intothe temple during its construction. The hill is about 1200 feet high. Visitors have to climb 750 steps uphill. Carry your own water bottles, sunscreens and hats. People normally club together Mandwa Beach and Gateway Of India while planning their visit to Kanakeshwar. Had to take directions from locals to reach the location. Ample open parking space. One hour climb to the top which includes some 700 steps. The temples needs some maintainance, but very peaceful inside. Breathtaking view from the top. A must visit. 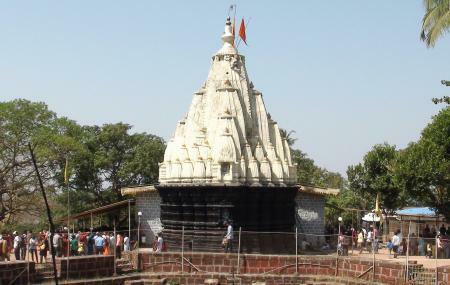 Kanakeshwar Mahadev temple is situated at the top of hill. There are more than six hundred step built from mapgaon village to temple. Total height from sea level is more than hundred metres. Temple is open at sunrise and close at sunset, but it's preferable to start early in morning . Total time taken for complete journey is approximately two and half hours. Temple is built with stones and there is elegant carvings on outer wall. You can have snacks and drinks from nearby homes. Jungle nearby temple is dense and pleasant to visit. Great place if you want to have a peace of mind. Stay for 1 night. Cool place .. Peace of mind 1 .Spritiual place .2. about 650 steps need to climb . 1 step is actually equal s to 3 step . 3.Best time to visit this place is during rainy season . 4.There is temple of God Shankar . 5. Drinking water is available but it is situated at top hence it is recommended to keep 1 bottle with u .